TextSpeak text to speech synthesis is nearly indistinguishable from human speech. Unlimited vocabulary offers simplicity. Phonetic corrections offer options for virtually perfect pronunciation. Expertise, great products and patented technology has positioned TextSpeak as the world's leader in Embedded Text to Speech chip solutions. when they've sent our products into Space! ex: French to German to English. Simple to use Dictionary Support. the RS232 or Ethernet channel. Hardware options includes 25 Watt High Definition Audio Amplifiers, powered from 7-24 volts. Speaker outputs use Automatic Ambient noise sensing with smart auto leveling to adjust volume automatically. Digital I/O offers control for signaling and keypad interfaces. 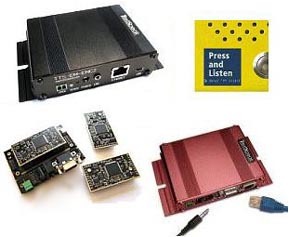 Universal interfaces include Ethernet, Serial and USB for sending Text, uploading pre-recorded wave files, managing dictionaries and managing setup and upgrades. USB simplifies setup and file transfer and allows flash drive access. solar standby and battery operation.